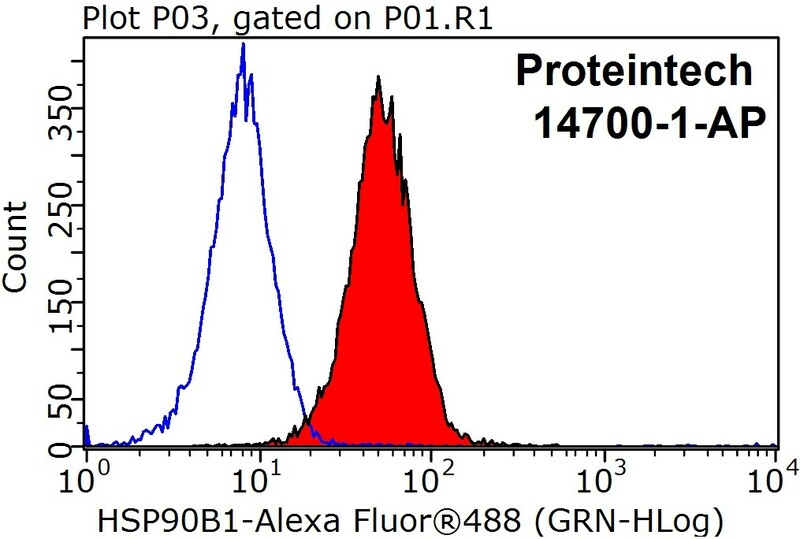 Immunofluorescent analysis of A431 cells, using HSP90B1 antibody 14700-1-AP at 1:50 dilution and Rhodamine-labeled goat anti-rabbit IgG (red). Blue pseudocolor = DAPI (fluorescent DNA dye). 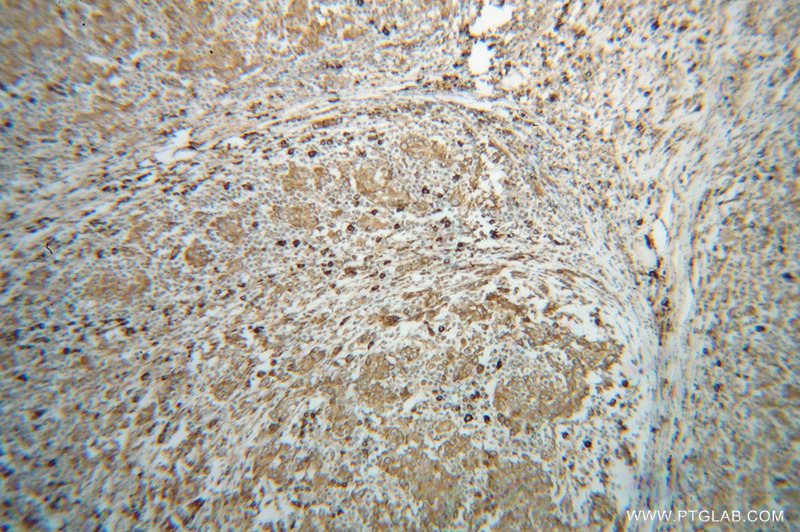 IP Result of anti-GRP94 (IP:14700-1-AP, 3ug; Detection:14700-1-AP 1:1000) with mouse liver tissue lysate 4000ug. 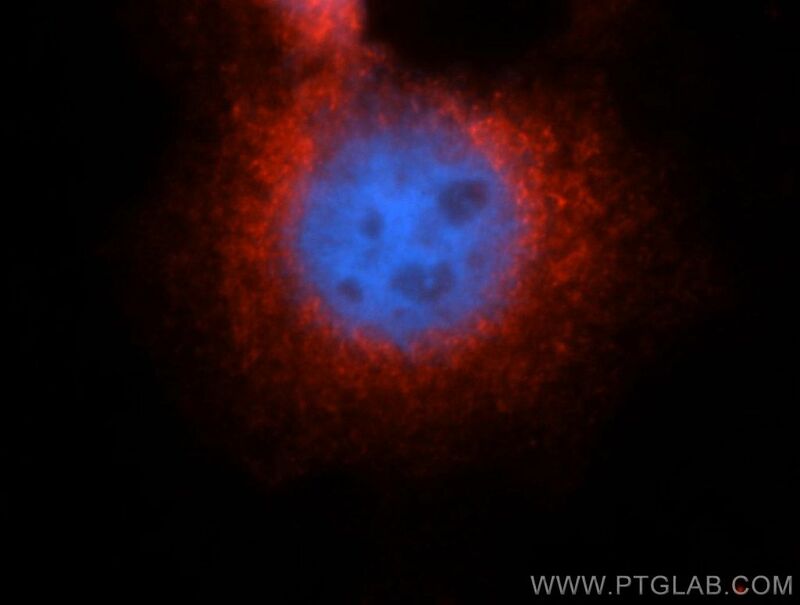 1X10^6 HEK-293T cells were stained with .2ug GRP94 antibody (14700-1-AP, red) and control antibody (blue). Fixed with 90% MeOH blocked with 3% BSA (30 min). Alexa Fluor 488-conjugated AffiniPure Goat Anti-Rabbit IgG(H+L) with dilution 1:1000. HSP90 proteins are highly conserved molecular chaperones, which normally associate with other cochaperones and play important roles in folding newly synthesized proteins or stabilizing and refolding denatured proteins after stress. 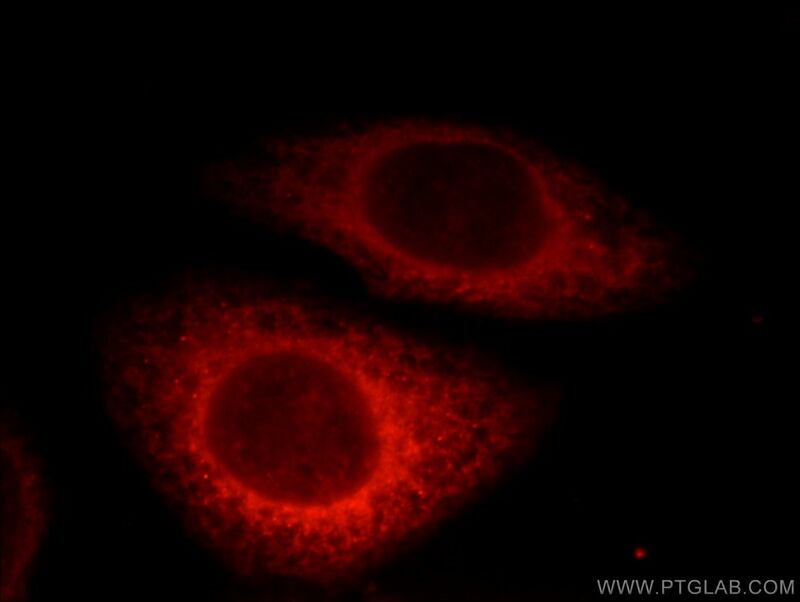 HSP90B1 (GP96 or GRP94) is an endoplasmic reticulum paralogue of the cytosolic HSP90. As a major ER chaperone to mediate the UPR and a master chaperone for Toll-like receptors (TLRs), HSP90b1 chaperones peptides to MHC class I molecules of dendritic cells and other antigen-presenting cells, as well as facilitating the assembly of immunoglobulin. The protein is also involved in many other bio-processes. 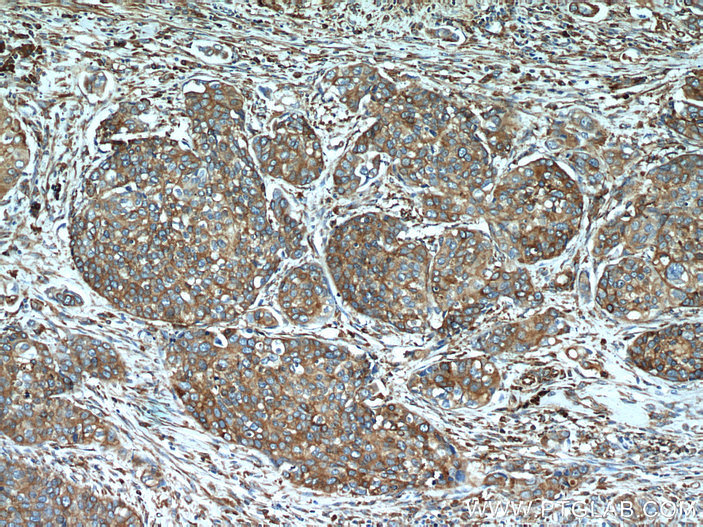 This antibody was generated against the C-terminal region of full-length HSP90b1. 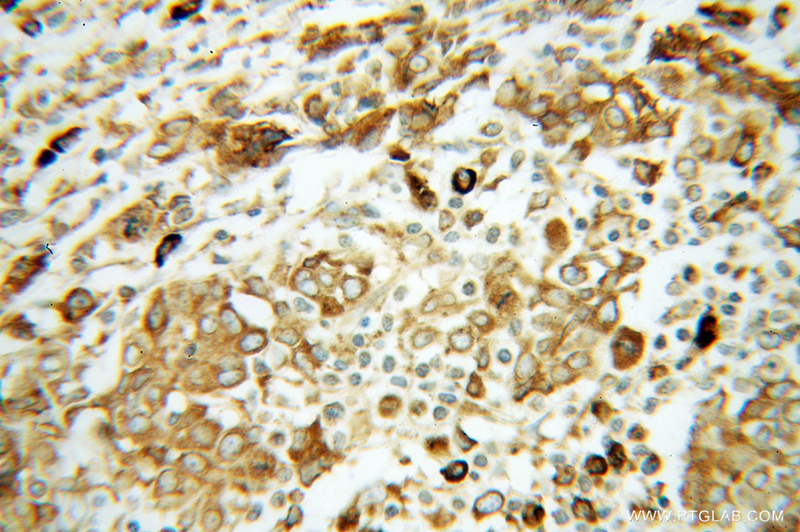 Cx31.1 acts as a tumour suppressor in non-small cell lung cancer (NSCLC) cell lines through inhibition of cell proliferation and metastasis. 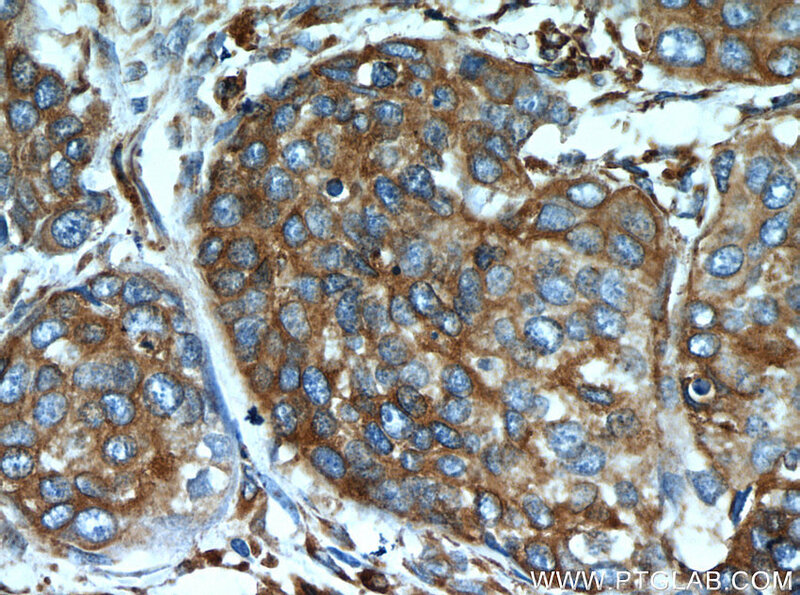 Upregulation of Phosphorylated HSP27, PRDX2, GRP75, GRP78 and GRP94 in Acquired Middle Ear Cholesteatoma Growth. Reduction in heat shock protein 90 correlates to neuronal vulnerability in the rat piriform cortex following status epilepticus. ER stress protein responses in relation to spatio-temporal dynamics of astroglial responses to status epilepticus in rats. 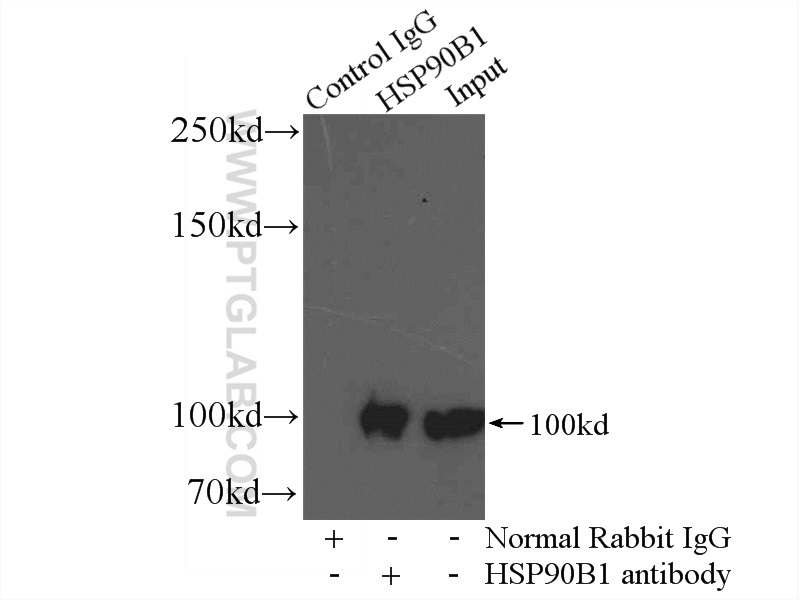 Immunofluorescent analysis of HepG2 cells, using HSP90B1 antibody 14700-1-AP at 1:25 dilution and Rhodamine-labeled goat anti-rabbit IgG (red).